Chic boutiques line the streets of Kolonaki, where one can also find plenty of cafes and restaurants in what may be Athens’ most sociable and sophisticated district. 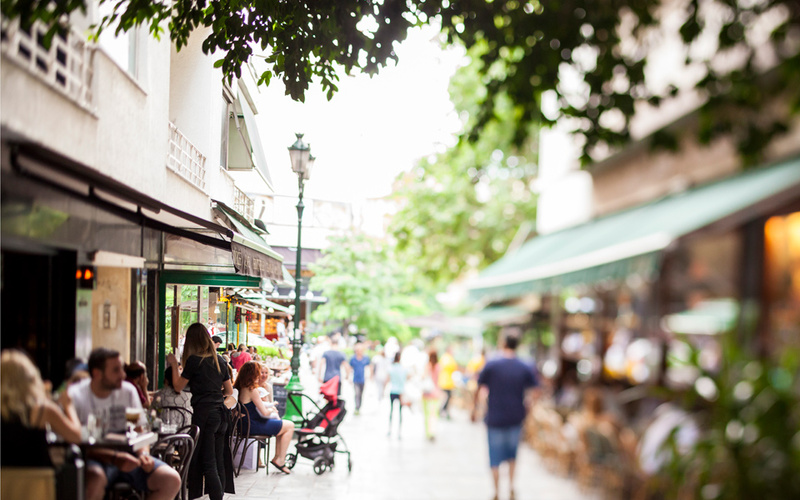 While it may not be the Upper East Side or Belgravia, Kolonaki, despite its cracked sidewalks and pot-holed, traffic-packed streets, is the Athenian version of an upscale neighborhood, thanks to the people who created it. Kolonaki became the absolute Place to Be after the first royal residences were built on Vassilissis Sofias Avenue, in 1836-1842. The neighborhood has managed to retain much of its sense of glamour even today. As the elegant edifices of the newly installed Bavarian court appeared, wealthy Athenians raced to build their own “palaces” – exquisite samples of neoclassical architecture – just across the street. Some of these wonderful buildings have been preserved and today either accommodate foreign diplomatic missions or have been turned into important museums. Politicians and magnates could walk to their offices at Parliament or Syntagma Square, on Kolonaki’s southwestern edge, well-coiffed ladies could keep abreast of the latest fashions from Paris and Milan, and nannies could take the children out for their afternoon walks at the conveniently located National Garden. Kolonaki was a symbol of Athens’ passage from a Balkan city into a member of the exclusive club of Europe’s West. Historic, architecturally distinctive buildings, many of them recently renovated, add memorable color to the Kolonaki cityscape. 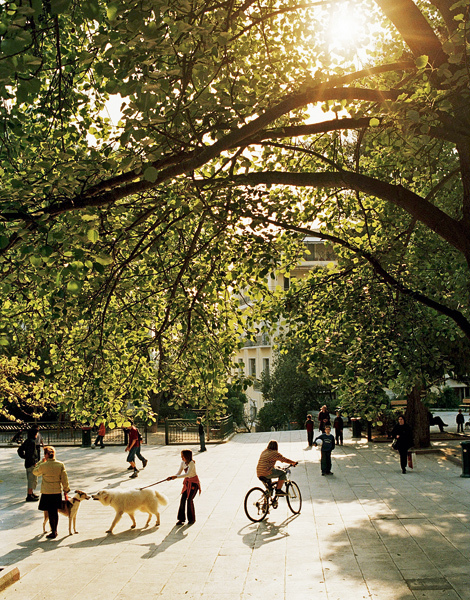 Dexameni Square is a favorite gathering place for local residents and vistors alike. On the other hand, Lycabettus Hill was little more than a grazing ground for shepherds during the 19th century, earning adjacent Kolonaki the wry reputation as a “neighborhood of goats.” Karl Fix, the Bavarian royals’ favorite beer maker, set up his ice-making shop on the hill’s slopes at that time. The neighborhood grew rapidly, attracting the sophisticated and the wealthy, and eventually engulfed Lycabettus during the building boom of the 1960s. With its high-end boutiques, glossy art galleries, fashionable cafes and restaurants, as well as bars and tavernas that have been around for decades, Kolonaki is a place to socialize, to see and be seen, where trendy young hipsters and ladies meeting for lunch rub elbows with well-dressed old gentlemen leisurely reading newspapers and discussing politics. 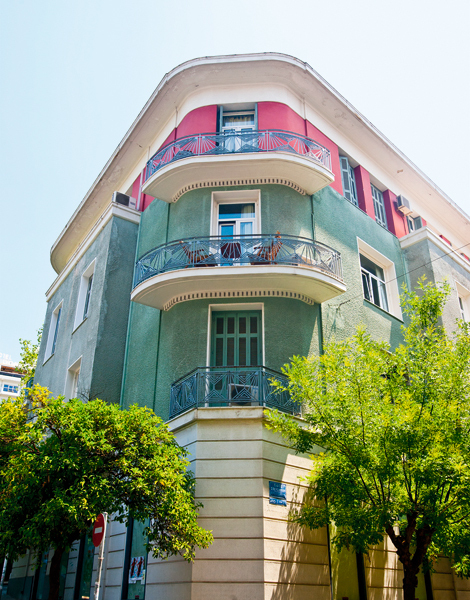 Athens’ most “aristocratic” neighborhood continued to expand through the 20th century, as a Kolonaki address became a sign of success for the upwardly-mobile middle class. Although many affluent city-dwellers started moving from central Athens to the outskirts during the 1980s, very few of these suburban areas can boast such a long history, which makes a casual stroll through Kolonaki’s architectural heritage fascinating.